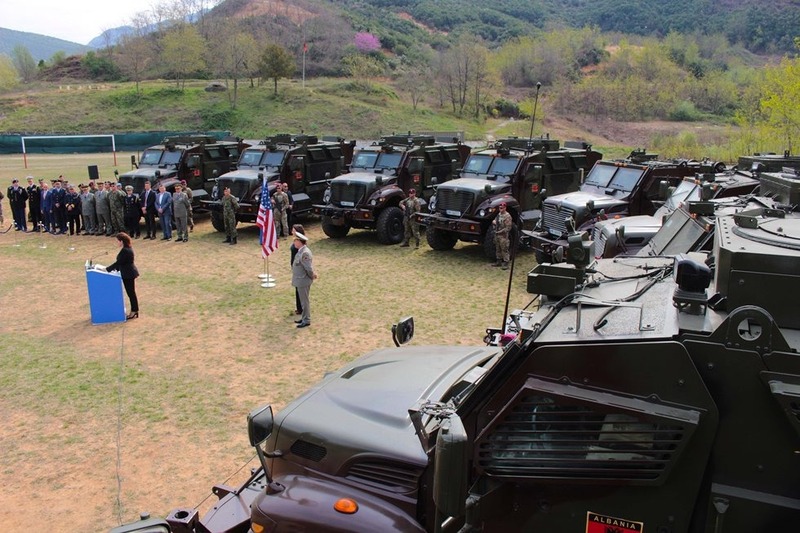 The US government has donated today 37 Mine Resistant Ambush Protected vehicles (MRAPs) and these vehicles will be used by Albania’s Armed Forces, as part of NATO’s collective defence. This ceremony was attended by Albanian Defence minister Olta Xhaçka, Chargé d’Affaires of the US embassy in Tirana, Leyla Moses-Ones and the Albanian General Chief of Staff, Bardhyl Kollçaku. “This package means more capabilities for us and more joint missions, but it also translates into more security for the country and the alliance”, Albanian Defence minister, Olta Xhaçka said. On her part, the representative of the US embassy to Tirana said praised Albania’s role in the region, stressing that the Ministry of Defence and Armed Forces have played a key role in boosting cooperation in the area of defence. “This new armored capability will enhance Albanian’s internal defense, strengthen NATO’s southern flank, and provide critical combat power to NATO that can be deployed in support of global operations. It is yet another example of how Albania is stepping up as a regional leader in the Balkans. Under the outstanding leadership of Minister Xhacka and General Kollcaku, communication and cooperation between our two militaries has never been stronger. While the delivery of these vehicles marks the completion of one phase of our cooperation, we are excited about the future and the potential to collaborate in additional ways to enhance Albania’s land, air, and sea capabilities.